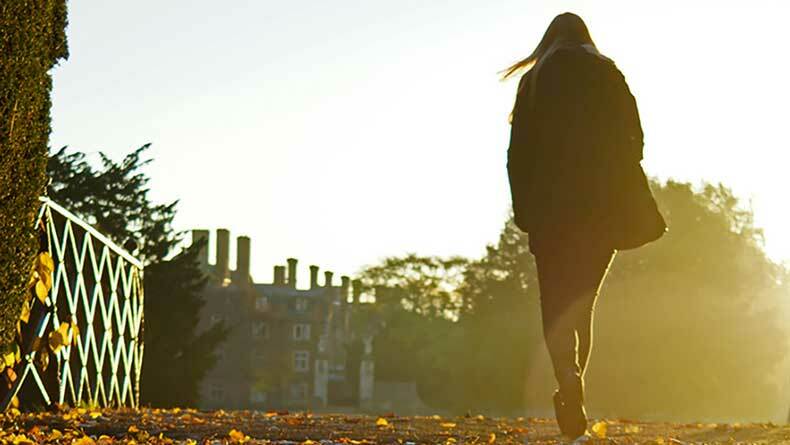 With its breath-taking architecture and tranquil gardens, all set on the banks of the River Cam, St John’s is a fantastic setting in which to spend your University years. It is also right in the middle of Cambridge. Most University facilities are virtually on the doorstep, as are the comforts and convenience of city life. 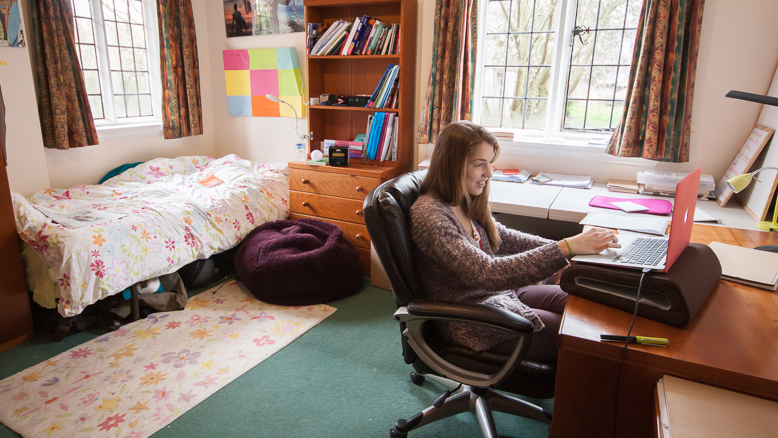 We provide guaranteed undergraduate accommodation throughout your course, while our rooms, food and facilities are reckoned to be some of the best in Cambridge. 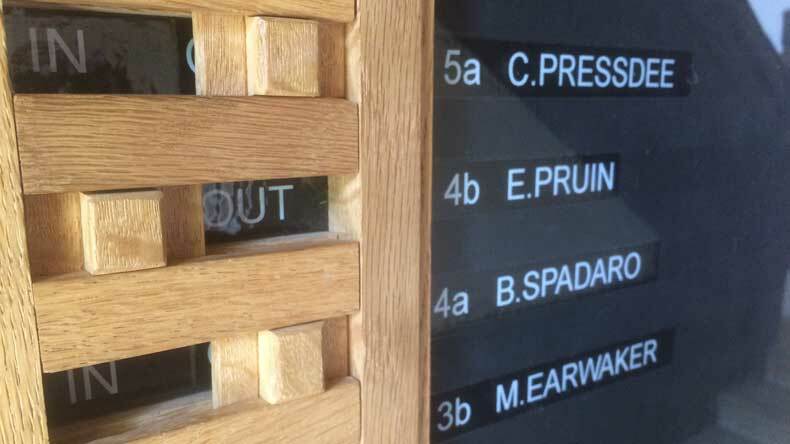 From here, the College stretches down to and over the River Cam, via its famous Bridge of Sighs, and across riverside lawns known as “The Backs”. It’s nearly half a mile to the back gate, beyond which lie a further 28 acres of playing fields! This beautiful setting makes for one of the most serene environments in Cambridge. Yet St John’s is also in the heart of the city, so you’ll never be more than a short walk or cycle from numerous pubs, clubs, restaurants, cafes, theatres, cinemas, bars and shops. With students accounting for about a fifth of the local population, there is always plenty going on. 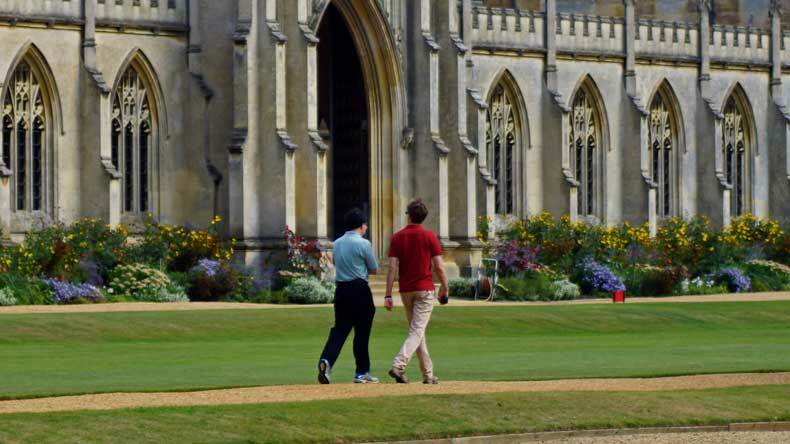 The College provides undergraduate students with accommodation throughout their time at Cambridge, and your room is at your disposal from October until June, which is handy if you want to leave your stuff here during the vacations! There are more than 500 rooms on our main site, occupied by Fellows and undergraduate students. If you’re really lucky, you might find yourself living somewhere previously occupied by one of our famous alumni, such as William Wordsworth, Douglas Adams or Paul Dirac. Many undergraduate first years, or freshers, start off living together in any of the Cripps Building, Chapel Court or North Court. In Cripps, typically, you will find yourself in a single room, sharing a bathroom and kitchen with up to three other people. For North and Chapel Court rooms, the sets consist of two student bedrooms, one being a smaller bedroom and one a larger bedroom (with the larger room being priced at a higher rent), sharing a bathroom and small kitchen with up to three other people. 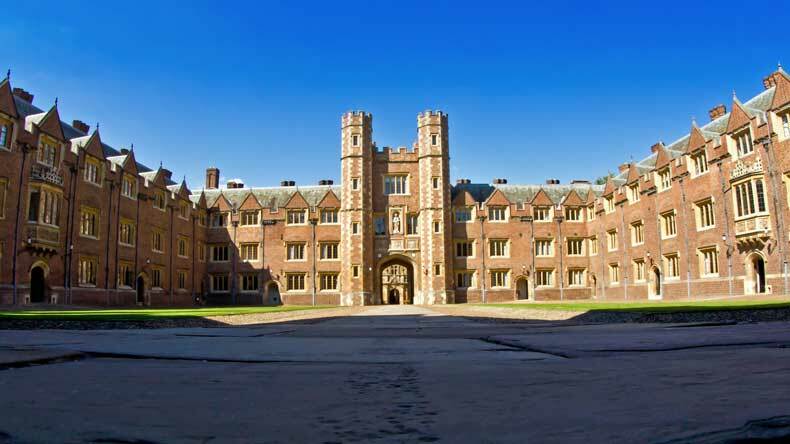 Later on, you can opt for a single room, share with friends, or live with a group in one of the nearby houses that the College owns. All rooms have high-speed internet connections, telephone points and access to a kitchen. We are also committed to ensuring that disabled students have all of the accommodation support they need. View our Accommodation Gallery here. If you don’t fancy cooking for yourself, there are plenty of other options. The College has a self-service restaurant, called the Buttery, which provides three meals a day at subsidised prices and caters for most dietary needs. We pride ourselves on our selection of free-range, Fair Trade, organic and locally-sourced products. For something really special, students can enjoy dinner in Hall with friends or guests. This is one of the great Cambridge traditions, and involves a fantastic, three-course silver-service meal for which gowns are worn. There are 160 tickets available every evening during term-time, and students are encouraged to come along. The College bar is the social hub of the College, where students, Fellows and staff can relax. As well as real ales, ciders, soft drinks, gourmet coffees and bar snacks are available. There are long tables with power-points for laptops, and we can switch off music in specific areas to make it easier to study. A wide programme of events take place throughout term, including quiz nights, music evenings, beer and cheese tastings, and games evenings. Look out for details on the College Bar Facebook page! The Buttery Dining Room is open everyday during the academic year (apart from one week at Christmas), offering a set menu for lunch and dinner, including a daily vegetarian option. The self-service, restaurant provides a varied selection of meals and snacks at subsidised prices, ranging from take-away baked potatoes, freshly baked pizza and sandwiches, to a choice of three main meals with vegetables along with a varied selection of homemade desserts . We also offer a selection of free-range, Fair Trade and organic products, as well as locally-sourced items. In the morning we are open for snacks, and a wide range of teas and coffees. Wi-fi is available in the Touchdown soft seating area. Dinner in Hall, at which gowns are worn and Grace is read, is a traditional part of College life, and it is hoped that Junior members of the College will dine regularly. The three course candle-lit meal is normally silver-served. Junior members can of course invite personal guests to dine in Hall with them. The College Bar offers a wide range of alcoholic and non-alcoholic beverages, along with coffees, teas and freshly-made baguettes and toasted sandwiches. We also sell hand-picked College wines, ports and sherries. The Bar is a focal point for College social activity with a very friendly atmosphere. Pretty much everything you need is somewhere on site. There are laundry facilities in College and all St John’s properties and rooms are cleaned by College staff known as “Bedders”. In the College’s Graduate Hostels, the “Bedders” only clean the communal areas. Every student has their own “pigeonhole” in the College’s mail room, next to the Great Gate Porter’s Lodge, where you can pick up parcels and personal messages. You will also be given a University Email account when you arrive. If you are into keeping fit, there is an on-site fitness centre with a range of cardiovascular and individual resistance equipment, as well as a free weights area. There are also music rooms, an art room, punts to take out on the river and exceptional sports facilities. Take a look at the “Leisure at St John’s” area for more information about what you can do here in your spare time. For many students, College is their first experience of living away from home for an extended period, so we’re committed to ensuring that you remain well looked after. During term, the College Health Centre is open on a walk-in basis. Our friendly College Nurse can help with a wide range of health and welfare problems, which are dealt with in the strictest confidence. Although it was originally a Christian foundation, St John’s has for generations welcomed people of all religions, and none. Nowadays, our Chaplain offers everyone confidential support and advice, regardless of your beliefs. Students are also allocated a Tutor, a Fellow of the College, who looks after the general welfare of their students. Students have the same Tutor throughout their time in College. All members of College are part of the Junior Combination Room (JCR). The JCR committee represents the student community in College and has its own welfare and equal opportunities officers. They also organise the entertainments in Freshers’ week – a week of ice-breaking activities that help new members to settle into life at St John’s. Graduate students are also members of the SBR (the College common room for graduate students). 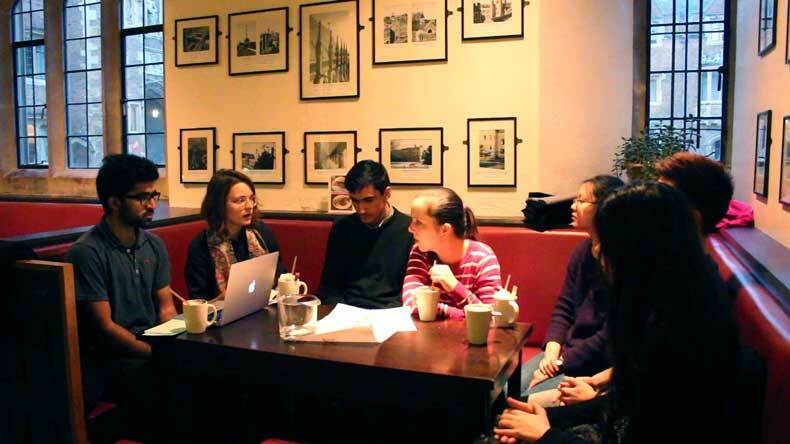 The SBR committee represents graduate students in College and organise social activities for them.